The greater wax moth, Galleria mellonella (GWM), is a natural pest of honey bee colonies. It has been recognized as one of the main pests to stored combs.The larvae burrow into the wax, damaging the bee comb and degenerating bee products, but also causes severe effects like driving the whole colony to abscond. Researchers from Xishuangbanna Tropical Botanical Garden (XTBG) tested whether bee alarm pheromones are eavesdropped on by the female moth, to orient to a better place or avoid a risky site as an oviposition site. 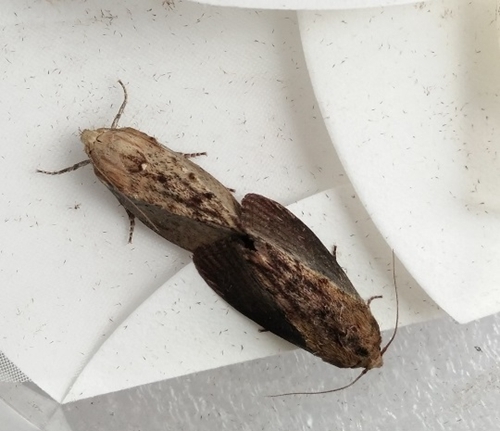 Firstly, the researchers analyzed the electroantennogram responses of the GWM (unmated moth, mated moth) to the alarm pheromone of A. cerana. The researchers then tested the performance of the GWM in a Y maze to determine whether they are attracted or repelled by bee alarm pheromones. Afterwards, they analyzed preference/avoidance of the GWM to the bee alarm pheromones for selecting an oviposition site. Both unmated and mated female GWMs showed physiological responses to the four bee alarm pheromones (isopentyl acetate, benzyl acetate, octyl acetate, and 2-heptanone). Unmated GWMs showed higher responses than mated GWMs. Both orientation and oviposition results showed no significant avoidance or preference. “The results indicate that bees seem to lose the arms race since GWMs successfully invade the beehive, reproduce in bee combs, and honeybees are not able to expel them, or even police their laid egg. Honeybees release alarm pheromones, which the greater wax moth can sense but seem to ignores”, said Prof. TAN Ken, principal investigator of the study. The study entitled “Losing the Arms Race: Greater Wax Moths Sense but Ignore Bee Alarm Pheromones” has been published in Insects.